Daytona USA, 1994-2019: The king of arcade racing is 25 years old! 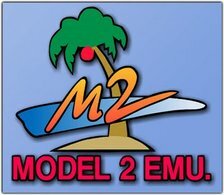 This is a HD texture pack for use with Elsemi's MODEL 2 emulator. Still a WIP, the goal is to retexturize everything in the game, fully respecting the original... SCREENSHOTS GALLERY AND WORK IN PROGRESS : -- CLICK HERE -- DOWNLOAD LINK for ElSemi's Model2Emu : -- CLICK HERE -- DOWNLOAD LINK for Nuexzz' hack users : -- CLICK HERE -- (Download links for pre-version) A readme file is included. Simple : I like the way you display the options ! Thanks for your attention about the textures, it's not a secret that your Daytona++ texture pack has been my inspiration and starting point . Watching your work too ! Thanks Nuexzz . Great job as usual. I Will stop using Emuloader and definitely keep your launcher ! The tunnel is now like the original I had a bug here, had to resize & replace the posters Redone the sails, road borders, rails Removed the Dinosaur Canyon posters Changed a few things here + rails + road borders Replaced the original message from AM2 (Font : Peinture fraiche by Qkila) The posters & the boat The animated board (beatiful animated eyes) Full size pics :THIS LINK Redone since the last release : - All the Hornet HD textures + Stickers + Dashboard - All the original boards/posters/flags in HD (all circuits) - The casino elements + the trees in the background (Beginner circuit) - Circuit Selection icons - GAME OVER & GOAL letters - The boats - Graffitis in Expert circuit "You Can't Be Satisfied Without It... SEGA Model 2" - Accurate road borders (all circuits) - Walls & mountains textures to make them perfectly seamless - Tunnel in advanced circuit A little more to do but I'm close to the end (respectful HD pack) Of course I'll say when I release it !! Made a few textures available here : SCREENSHOT GALLERY. I'll update the 1st link when everything is done, about 2 weeks, I think (Nothing's promised). A super cool Daytona fan has given me copies of the original flyers, so I have been able to recreate the original stickers. Thanks Axel ! Salut m'sieur ! Oui ! j'ai juste viré des photos du 1er post pour pouvoir glisser la dernière (j'ai un espace limité sur le forum pour mes média) . Quand je ferai une mise à jour des packs je ferai un renvoi au 1er post avec annonce claire ! L'update va venir bientôt, j'ai refait 50 textures, encore quelques-unes pour renforcer la fidélité avec les graphismes originaux. Lots of details in the work to recreate the full Daytona USA experience in HD, based on Daytona fans' requests. I feel like a slave for this project lol. I didn't expect so much interest. Feel free to comment or request here too, I'm listening to everyone to try to make the best graphic patch ! A few fans have requested the Casino elements in the Beginner course, I don't really know why I changed them (I love SegaSaturn). That's done ! Same thing for the dice... I'll still apply the SegaSaturn & Rubik's Cube textures on the "Daytona USA Saturn Adds" rom. Merci pour la réponse ! Je me souviens avoir testé des builds d'autres sites avec de fortes distorsions de son lors de mes 1er essais. Voilà pourquoi je voulais poser cette question, car les vôtres se démarquent par leur qualité Merci bien, et top job pour le force feedback ! Salut à tous ! Nuexzz est entrain de concocter un joli petit launcher qui facilitera la vie de tout le monde, en l'occurence on n'aura plus à éditer le fichier ini manuellement, ce qui est cool pour le choix des résolutions graphiques notamment. Il ne le mettra à dispo que lorsque tout sera parfait. En attendant, j'ai fait un pack de textures pour Daytona que je suis content de partager et que je vous propose de découvrir. Bonjour Spindizzi ! Cela fait un petit moment que j'utilise tes builds. Je vois sur le site de Supermodel que ceux de Jiterdomer sont attendus par certains comme des références... Y-a-t-il une différence majeure avec les tiens ? (perso je n'en vois aucune, dans le sens où tout fonctionne à merveille dans les deux cas). Merci beaucoup en tout cas !